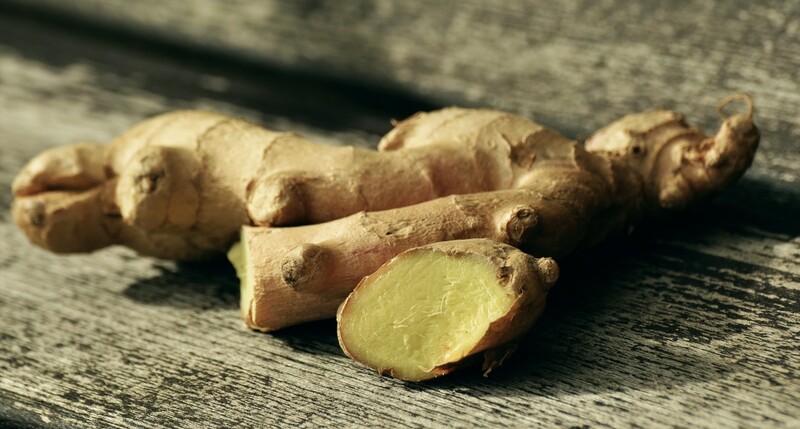 Ginger is a time-honored spice that finds it's way into a host of culinary dishes. It's famous for treating digestive problems and boosting the immune system. Ginger oil boasts extensive health benefits and its warming aroma can help you feel invigorated. Find out how ginger oil is made and how its health benefits can improve your quality of life. Ginger oil is extracted from the root of the ginger plant known by the botanical name Zingiber officinale. Ginger is part of the plant family Zingiberaceae, which also includes turmeric and cardamom. Ginger plants feature strong root systems and bright yellow flowers. The ginger plant is native to India and the Southern Asian continent. Ginger is popularly found in China and is a staple of Chinese cuisine. The plant made its way to the western world along the spice route and was used for medicinal purposes by the Ancient Greeks and Romans. The roots are harvested by hand or using machinery and transported to a processing facility where they are subjected to an extraction method known as steam distilled. The extraction method of steam distillation removes the oils from these plant parts using heat and steam. Hot temperatures trigger the release of the oils, which then collect along a cold steam pipe. The water is then separated from the oils leaving behind pure 100 percent ginger essential oil. Ginger root is commonly used in teas and culinary dishes due to its pleasantly spicy flavor. Ginger essential oil can be extracted from both dried roots of fresh ginger roots. Fresh root ginger oils tend to be brighter and more uplifting in fragrance. Dried root oils often have a grounding effect and a stronger earthy aroma. Both types can be used interchangeably and offer the same health benefits. Ginger oil has warming and soothing properties that make it ideal for use in aromatherapy. It's warming qualities help to uplift mood and energize. It features middle notes that are spicy, woody and warm with earthy undertones. Ginger oil blends well with ylang ylang oil, rose oil, cedarwood oil, and palmarosa oil. The most famed ginger essential oil benefit is its ability to aid the digestive system. Ginger helps to soothe upset stomach and reduce feelings of nausea. This oil also helps streamline digestive processes and may protect the stomach from damage or infection. Ginger is one of the most popular natural remedies for nausea. It's marketed in the form of gum for seasickness and motion sickness. A study published in Anesthesia and Analgesia examined the use of ginger oil aromatherapy in treating postoperative nausea. The randomized trial consisted of 301 participants who were given ginger oil, an essential oil blend, or a saline placebo. The patients who inhaled ginger oil demonstrated significant decreases in symptoms of nausea. 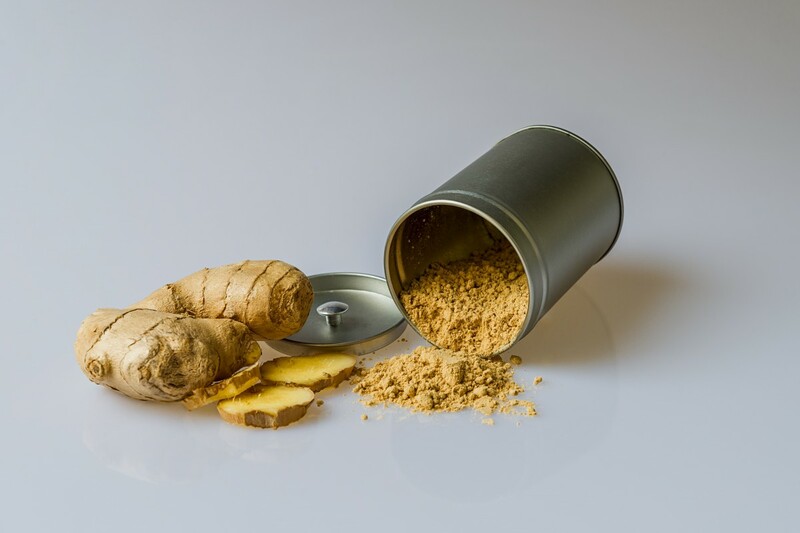 A meta-analysis published in Integrative Medicine Insights reviewed dozens of studies on the efficacy of ginger on nausea. Researchers found that ginger was more effective than placebo in treating nausea caused by chemotherapy, pregnancy, and motion. Some of the studies showed that ginger oil was more effective than over-the-counter medications. Scientists concluded that more research is needed for conclusive results, but ginger oil is an effective and affordable treatment for nausea. Ginger oil may protect the stomach from ulcers. A study published in the Journal of Basic and Clinical Pharmacology and Physiology examined the effect of ginger on rats with ulcers. Ginger essential oil was shown to reduce existing ulcers by 85.1%. The ginger oil worked to increase antioxidant enzymes that help repair damage in the stomach. The essential oil was also found to reduce oxidative stress that can cause other problems including stomach cancer. Diffuse 3 drops of ginger in an ultrasonic diffuser or personal inhaler to alleviate symptoms of nausea. Diffuse for 30 to 60 minutes. Focus on breathing deeply through your nose and out through your mouth. Inhale the scent of ginger before boarding a boat or airplane. You can also place a few drops on your wrists to inhale during the journey. Make sure to blend ginger oil with carrier oil such as coconut oil if applying topically. Ginger essential oil contains a compound known as zingibain that has demonstrated analgesic properties. Combined with it's anti-inflammatory properties, this oil can provide pain relief for headaches, menstrual cramps, and achy muscles. Ginger oil can also treat stomach aches caused by bloating and cramps. The University of Georgia conducted two studies examining the pain reliving properties of ginger. The studies each lasted 11 days with one focusing on the effects of dried ginger and the other on heated or cooked ginger. The studies consisted of a total of 74 volunteers who received ginger supplements or a placebo. The results showed that both ginger supplements reduced exercise-induced pain by 25%. Scientists believe ginger reduces inflammation, which lessens pain caused by strenuous workouts. Ginger oil may also help treat arthritis. A study published in 2001 in Arthritis and Rheumatism examined the efficacy of ginger extract on osteoarthritis patients with knee pain. The randomized, double blind study consisted of 261 patients and lasted for 6 weeks. 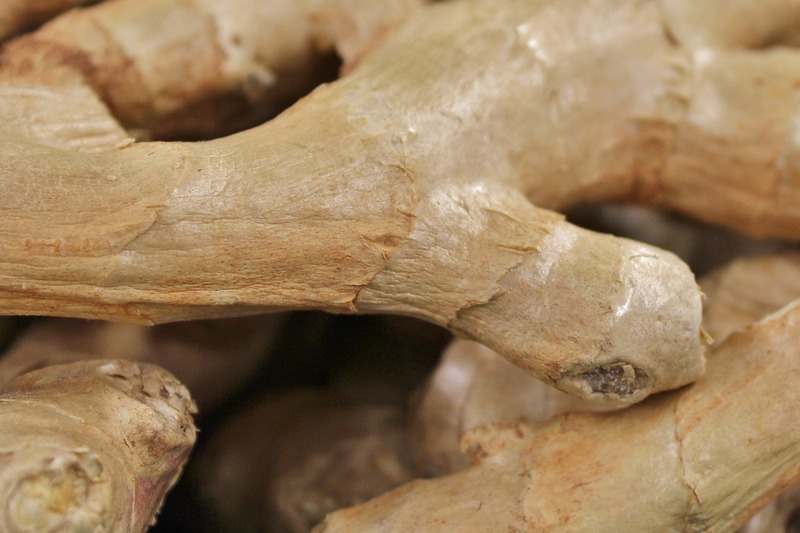 Patients received either ginger extract or a placebo twice per day. At the conclusion of the study, patients who received ginger extract demonstrated a 63% pain reduction in their knees upon standing. The patients also experienced significant pain reduction when walking up to 50 feet. A second study published in 2008 in Complementary Therapies in Medicine examined a group of 59 individuals with moderate to severe knee pain. The double blind, placebo-controlled study lasted three weeks. Patients were treated with oil massage containing ginger and orange oil or a placebo made of olive oil. Participants who received ginger oil demonstrated lower levels of stiffness and pain intensity compared to the placebo group. Ginger may also help alleviate pain associated with headaches and migraines. 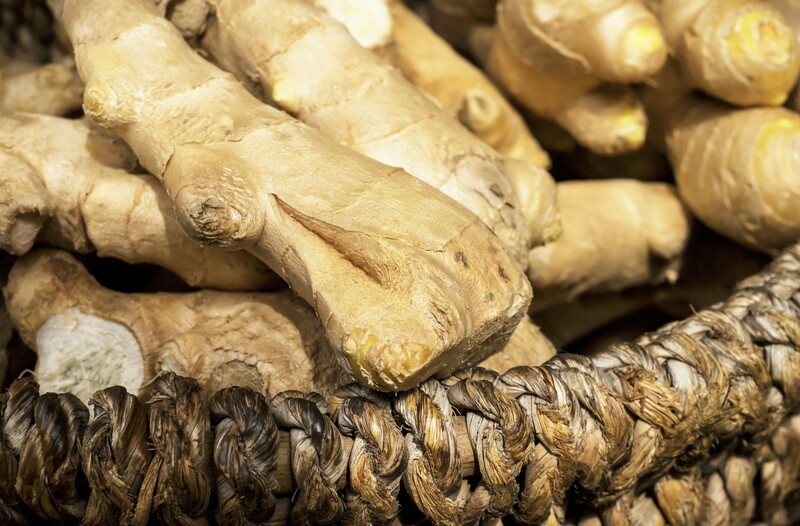 A study published in Phytotherapy Research examined the effects of ginger and sumatriptan—a prescription medication for migraines. The randomized, double blind study consisted of 100 participants who suffered from acute migraines without aura. The efficacy of ginger and sumatriptan were similar two hours after use. Both treatments resulted in a reduction of headache severity. The results show ginger may be just as effective as prescribed migraine medications in reducing pain. Combine 5 drops of ginger oil with carrier oil such as rose hip oil. Rub in gentle circular motions on the lower abdomen to treat cramps and stomach pains. Rub gently on temples or forehead to get relief from headache pains. Alternatively, make a sports massage oil using equal amounts arnica oil, carrier oil, and ginger oil. Use moderate pressure to work the oil into sore muscles after a gym workout or strenuous exercise. Ginger essential oil is a popular home remedy for respiratory problems. This oil works as an expectorant, helping to loosen chest congestion and mucus that can make it hard to breathe. Ginger oil may also help alleviate serious breathing conditions such as asthma. Asthma is a breathing condition where patients find it difficult to breathe due to strenuous activity, allergens, or anxiety. Asthma causes inflammation in airways, making it difficult to breathe. Asthma attacks can result in death in serious cases. The incidence of asthma has increased over the last decade, largely due to pollution and other environmental factors. A study published by the American Thoracic Society examined the effects of ginger oil on human airways. Researchers found that the main chemical components in ginger—gingerol and shogaol—decreases inflammation and improved breathing by 70%. The anti-inflammatory properties of ginger oil help to soother throat muscles and trigger chemical receptors to relax the airways. Always use a rescue inhaler if you are experiencing a severe asthma attack. Before an asthma attack occurs, you can treat feelings of shallow breathing with essential oils. Diffuse 4 drops of ginger oil in an ultrasonic or humidifying diffuser. Inhale the scent, focusing on calming your nerves and breathing as deeply as possible. Oxidative stress occurs when the human body can't remove toxins and chemicals that can cause harmful damage. The process is similar to the way fruits and vegetables turn brown when exposed to oxygen. Oxidative stress is essentially the human body's form of rust. Oxidative stress has been linked to serious illnesses including cancer and heart disease. The damage usually occurs with high levels of inflammation. Ginger oil's anti-inflammatory properties help prevent oxidative stress. Antioxidants fight free radicals caused by pollution and smoking. These free radicals can alter cellular processes and result in fine lines and wrinkles or neurological diseases. Using ginger oil daily can help eliminate free radicals and prevent oxidative damage. Ginger oil aromatherapy can help detoxify the body. Diffuse a few drops of this oil each day. Alternatively, you can unwind with a hot ginger oil bath. Add 5 drops to running bath water. Soak for 15 to 20 minutes, inhaling the aroma deeply. Millions of Americans suffer from heart disease including high cholesterol. Ginger oil may be able to reduce bad cholesterol levels. Ginger oil may also help to increase fat burning, reducing the risk of obesity and cardiovascular disease. A study published in the Journal of Nutrition examined the effect of ginger extract on mice susceptible to heart disease. Mice that received 250 micrograms of ginger extract had a 29% reduction in overall cholesterol and a 27% reduction of triglycerides. The same mice also demonstrated a decrease of 67% in bad cholesterol known as LDL cholesterol. A second study published in Peritoneal Dialysis International examined the effect of ginger on lipids and lipoproteins. One of the main risk factors of heart disease is irregular level of lipids. The study consisted of 36 patients in a randomized, double blind trial. The patients received either 1000 mg of ginger or a placebo over the period of 10 weeks. Patients who received ginger showed a 15% decrease in triglycerides compared to the placebo group. Breathing in the scent of ginger may help prevent heart disease and improve fat burning. Add a few drops to a cotton ball and place underneath your pillow. Alternatively, add 5 to 6 drops to a diffuser and diffuse for 30 to 60 minutes twice per day. Ginger oil may cause skin rash or irritation in people with sensitive skin. Test the oil on a small patch of skin. If no irritation or side effects occur, you can apply the oil liberally in combination with carrier oil. Ginger oil may also be phototoxic—it can react with UV rays and cause rash or burns. Avoid going out in direct sunlight for 12 hours after applying ginger oil topically. Be careful to keep ginger oil away from sensitive areas including your eyes, nose and mouth. Some brands approve oral consumption of essential oils. The U.S. Food and Drug Administration has certified some essential oils as 'generally recognized as safe' or GRAS for human consumption. Ginger oil can be found on that approval list here. Essential oils should only be taken orally by individuals who are experts or under the care of a qualified practitioner. Only therapeutic grade or food grade essential oils should be consumed orally. If you are a beginner, stick to eating powdered ginger or ginger snaps for safety. Since ginger oil is a highly concentrated form of ginger, it should be consumed in small quantities. Experts typically recommend 1 drop for every 20 ounces of water. Pregnant women or those who are breastfeeding should seek medical advice before using essential oils. Ginger oil's spicy nature may cause discomfort for some women. Use sparingly and never apply ginger oil t children under 2 years of age. Ginger oil can help soothe digestive problems including nausea and ulcers. This oil can also help alleviate pain and reduce inflammation that can lead to serious illness. Ginger oil emits a delightfully spicy fragrance with warming notes. Add it to a diffuser, a hot bath, or homemade massage oil to reap its health benefits.